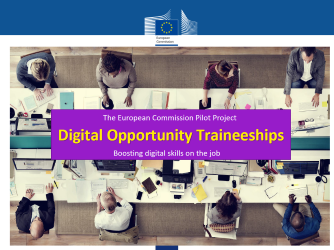 “Digital Opportunity Traineeships” is a cross border pilot project of the European Commission, offering traineeships in digital skills to students and recent graduates. Companies interested in publishing their traineeship offers, within the framework of the Digital Opportunity Traineeships project, are invited to submit the relevant template to the National Coalition for Digital Skills and Jobs. The template will be forwarded on the Drop’pin@Eures or ErasmusIntern websites by the National Coalition.